The R-44 is a compact, four channel, solid-state field recorder that uses SD or large capacity SDHC cards as the storage media enabling quiet and reliable recording for a variety of professional audio needs. Capture up to 4 channels of uncompressed audio with selectable bit depths (16-bit or 24-bit) and sampling frequencies (44.1kHz/48kHz/88.2kHz/96kHz/192kHz). Onboard effects include limiter, low cut filter, 3-band EQ, 6-band GEQ, Enhancer, and DeEsser. The R-44 is a part of Roland's series of audio field recorders. 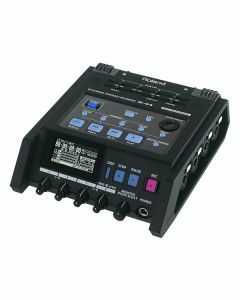 The Roland R-44 is perfect for on-site recording situations that necessitate the highest quality without succumbing to the rigours of the environment. Compact and lightweight, the R-44 uses SD or large capacity SDHC cards to support four channels of industry-leading, uncompressed audio with adjustable bit depths and sampling frequencies. Silent and sturdy with no moving parts, the R-44 also delivers several integrated effects including a limiter, low-cut filter, 3-band EQ, 6-band GEQ, Enhancer, and DeEsser to further assist in the crafting of your recordings. Any professional setup that demands the best will see an instant improvement to high-quality recordings with Roland’s R-44. While the R-44 offers a host of inputs and outputs for almost any conceivable field recording situation, it is delivered with top-end stereo microphone and monitor speakers already set up and ready for immediate use. The Roland R-44 also features multiple professional effects for honing your audio tracks - either in tandem with recording or during monitoring and playback. An onboard limiter helps subdue unexpected peaks in sound from an input source, freeing your recordings from any unwanted distortion or clipping. Equally valuable, the included low-cut filter mitigates wind or mic handling noise. Other previously mentioned effects can also all be applied to greatly increase the proficiency of your audio tracks.